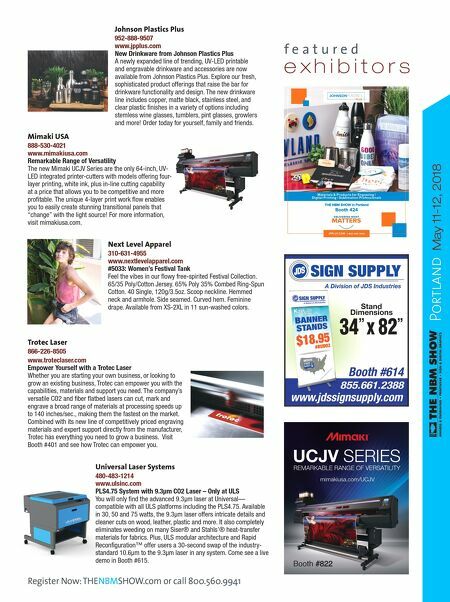 Portland May 11-12, 2018 UCJV SERIES REMARKABLE RANGE OF VERSATILITY mimakiusa.com/UCJV UCJV 225 x275.indd 1 2/28/18 9:36 AM Booth #822 www.jdssignsupply.com 855.661.2388 Booth #614 Materials & Products for Engraving | Digital Printing | Sublimation Professionals THE NBM SHOW in Portland Booth 424 JPPLUS.COM • 1-800-869-7800 f e a t u r e d e x h i b i t o r s Universal Laser Systems 480-483-1214 www.ulsinc.com PLS4.75 System with 9.3µm CO2 Laser – Only at ULS You will only find the advanced 9.3µm laser at Universal— compatible with all ULS platforms including the PLS4.75. Available in 30, 50 and 75 watts, the 9.3µm laser offers intricate details and cleaner cuts on wood, leather, plastic and more. It also completely eliminates weeding on many Siser® and Stahls'® heat-transfer materials for fabrics. Plus, ULS modular architecture and Rapid Reconfiguration™ offer users a 30-second swap of the industry- standard 10.6µm to the 9.3µm laser in any system. Come see a live demo in Booth #615. Trotec Laser 866-226-8505 www.troteclaser.com Empower Yourself with a Trotec Laser Whether you are starting your own business, or looking to grow an existing business, Trotec can empower you with the capabilities, materials and support you need. The company's versatile CO2 and fiber flatbed lasers can cut, mark and engrave a broad range of materials at processing speeds up to 140 inches/sec., making them the fastest on the market. Combined with its new line of competitively priced engraving materials and expert support directly from the manufacturer, Trotec has everything you need to grow a business. 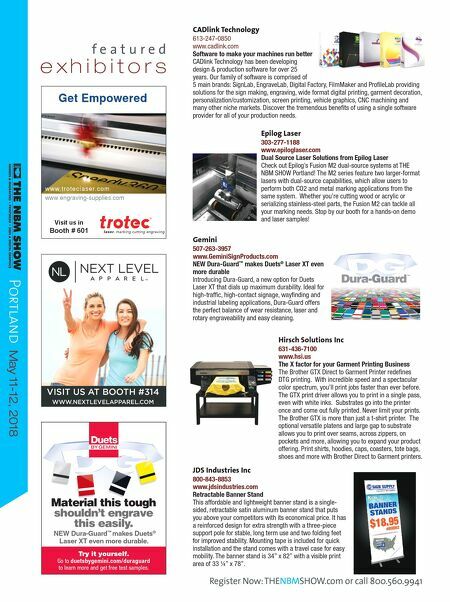 Visit Booth #401 and see how Trotec can empower you. Next Level Apparel 310-631-4955 www.nextlevelapparel.com #5033: Women's Festival Tank Feel the vibes in our flowy free-spirited Festival Collection. 65/35 Poly/Cotton Jersey. 65% Poly 35% Combed Ring-Spun Cotton. 40 Single, 120g/3.5oz. Scoop neckline. Hemmed neck and armhole. Side seamed. Curved hem. Feminine drape. Available from XS-2XL in 11 sun-washed colors. Johnson Plastics Plus 952-888-9507 www.jpplus.com New Drinkware from Johnson Plastics Plus A newly expanded line of trending, UV-LED printable and engravable drinkware and accessories are now available from Johnson Plastics Plus. Explore our fresh, sophisticated product offerings that raise the bar for drinkware functionality and design. The new drinkware line includes copper, matte black, stainless steel, and clear plastic finishes in a variety of options including stemless wine glasses, tumblers, pint glasses, growlers and more! Order today for yourself, family and friends. Register Now: THENBMSHOW.com or call 800.560.9941 Mimaki USA 888-530-4021 www.mimakiusa.com Remarkable Range of Versatility The new Mimaki UCJV Series are the only 64-inch, UV- LED integrated printer-cutters with models offering four- layer printing, white ink, plus in-line cutting capability at a price that allows you to be competitive and more profitable. The unique 4-layer print work flow enables you to easily create stunning transitional panels that "change" with the light source! For more information, visit mimakiusa.com.